ARTICLE 1 –Jewish Home ministers call off walkout. No snap election. The two ministers spoke at a special news conference they called in the Knesset, at which they were widely predicted to announce their resignations. Some 40 members of family fighting eviction since 2008 must leave home in Sheikh Jarrah neighborhood within months. The Supreme Court on Thursday denied a Jerusalem Arab family’s appeal against their eviction and refused to hear a case on the ownership of the building, citing the statute of limitations. As a result, around 40 family members will have to leave their home in East Jerusalem’s Sheikh Jarrah neighborhood within months. The ruling will also make it very difficult for dozens of other Palestinian families in Sheikh Jarrah to avoid eviction. The appellants are members of the Sabag family, who live in a building with five apartments. About 40 relatives, including 30 children, live there. Donald Trump’s supporters take him seriously but not literally; whereas, Democrats and their media acolytes, along with Never Trump Republicans, take him literally but not seriously. Before the midterm election, Trump intimated he could win the election and outperform previous presidents who generally lost seats in their first midterm election; however, he also acknowledged that Democrats may win the House. Now, many claim he lost the election. Although the Democratic Party won the House, Trump won the election. What President Trump achieved by his net gain of Senate seats in the midterm was unprecedented for a Republican. He has also essentially eliminated the Never Trump section of the Republican Party. Since the beginning of his administration, Never Trump Republicans refused to accept his leadership of their party and therefore use every opportunity to undermine him. 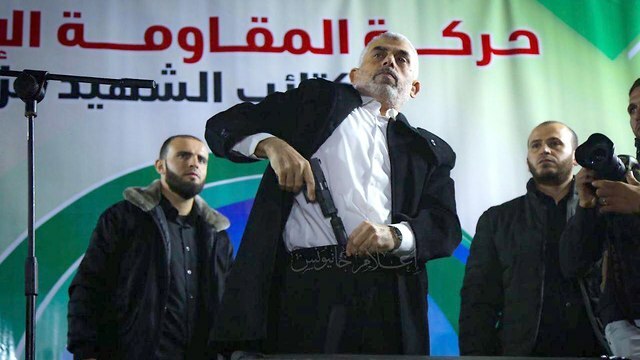 At a rally in memory of Hamas fighters killed in Gaza last week, Hamas leader in the Gaza Strip Yahya Sinwar draws a pistol and threatens Israel once again: ‘The first barrage to hit Tel Aviv will surprise Israel’; Arab media reports progress in negotiations for POWs and MIAs exchange; delegation of senior Egyptian intelligence officials leave Gaza. During a memorial service for Hamas fighters killed in the firefight that erupted after the Palestinians uncovered a secret IDF mission in Gaza last week, Hamas leader in the Gaza Strip Yahya Sinwar pulled out a gun—which he claimed belongs to an IDF soldier who participated in the operation—and declared: “Next time, the barrage of rockets will reach Tel Aviv and its surrounding area. Netanyahu thanks Trump administration for ‘no’ vote, which broke with Washington’s longtime practice of abstaining on status of the Heights. Prime Minister Benjamin Netanyahu on Sunday welcomed a US decision to vote for the first time against an annual UN resolution condemning Israeli sovereignty of the Golan Heights. “I would like to thank President [Donald] Trump and Ambassador [Nikki] Haley on this important and just vote that is completely in keeping with my policy,” Netanyahu said at the start of the weekly cabinet meeting. “Israel will always remain on the Golan Heights, and the Golan Heights will always remain in our hands,” he said.